This simple and cost-effective door bell circuit is based on IC 8021-2 from Formox Semiconductors (Website address: fortech@mantramail. com). It is an 8-pin DIP IC whose only four pins, as shown in the circuit, have been used. The IC has an in-built circuitry to produce ding dong sound each time its pin 3 is pulled low. The sound is stored in the IC as bits, as in a ROM. 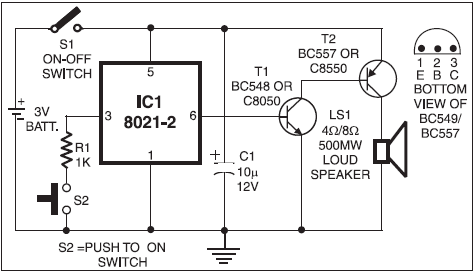 The sound output from the IC can’t however drive a speaker directly, as this puts strain on the device. Therefore a complementary- pair, two-transistor amplifier is used to amplify the sound to a fair level of audibility. You may either use a piezo tweeter or an 8-ohm, 500 MW speaker at the output. During the standby period, the IC consumes nominal current of a few micro amperes only. Therefore switch S1 may be kept closed. Each time switch S2 is pressed, ding dong sound is produced twice. If you try to press switch S2 a second time when the first ding dong sound is still being produced, it has no effect whatever and the two ding-dong bell sounds will be invariably produced. The circuit costs no more than Rs 35 and the IC 8021-2 used in the circuit is readily available for around Rs 15 in the market.